Nothing beats the feeling of driving a car with a superbly polished finish. With time, however, the exterior of your car is bound to deteriorate because of exposure to the elements, dust, or rain and this may age your car’s exterior surfaces significantly, while your car’s glimmer and shine fades and you find yourself looking for the list of the best plastic restorers for automobiles. You may use a variety of products to wash, polish or wax the surfaces but it may be challenging to do the same to the plastic trims of your car. Plastic restorers are products designed to give you back the initial shine to your car’s exterior plastic and trim. Before you make a purchase, you must first do your research on the product that suits you. This should be a common practice whenever you are buying new accessories for your car including simple items such as bluetooth sets. While most plastic restorers will be able to keep your car from further damage from the elements, it is important to confirm whether the product you are purchasing suits the kind of plastic you want to restore. Faded trim, cladding, plastic and bumpers come back to life with this high quality plastic restorer. 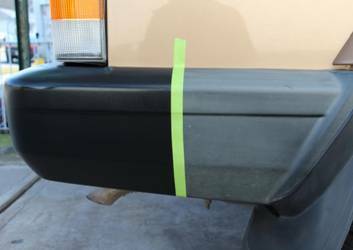 Unlike the substandard silicone cover-ups used to make bumper dyes, the permanent dye used to make Detail King Trim Kote Restorer lasts for as much as between one and two years. A thick single coat of the plastic restorer can last as long as 1-2 years. 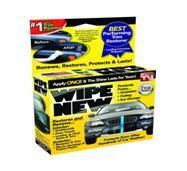 This product is perfect for car body moldings, plastic mirror housings, rocker panels, wheel flairs and so much more. 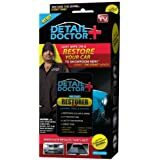 You can bring back the shine on your car by using Detail Doctor’s Instant Restorer, just as you see Danny Koker do it with his car on TV. A coat of it on your car’s exterior plastic and trim will make your car looking good as new for months. Enabled with UV Protection, you can be sure that your car will be well protected from the harsh effects of the sun for a long time to come. 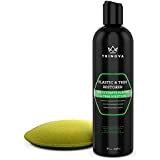 It comes in an 8oz bottle and you can even use your own cloth or sponge to apply in small portions at a time on your moldings, mirrors, door handles, bumpers and hood. 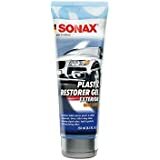 Sonax Plastic Restorer Gel is one of the few plastic restorers in that market that are multipurpose in use for all colors of plastic and trim. It will revitalize your car’s exterior trim and other components by giving them a great new shine. You can also use Sonax on your tires as well as on other rubber components. The microscopic Nano granules in Sonax give it the ability to offer long-lasting protection and conservation due to their penetration into structured and grained surfaces. The gel is transparent and suited for all colors of bumpers, plastic exterior components and trim. Wipe New Trim Restorer is ideal for use on chrome, vinyl, plastic, leather, rubber, acrylic, metallic and ceramic surfaces. However, it is not advisable to use the product on glass. About 1.55 ounces of the product will be sufficient for treating the exterior or interior of the standard sized car. Better still, it comes with a free pro detailer kit. Unlike other silicon-based products, which require reapplication constantly, this product does not need to be reapplied frequently. The product can be used on boats, RVs and motorcycles. 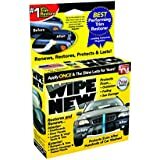 It include a set including one detail brush, a headlight applicator, a headlight prep pad, two wipe new applicator cloths and a bottle of 1.5 ounce fluid bottle of Wipe New. Another set of the product may include a pair of nitrile gloves, two Wipe New applicator cloths, a headlight applicator, a bottle of 1.5 fluid ounce of Wipe New and one detail brush. This is the ultimate plastic and trim restorer that will restore your car’s exterior shine and give it back its showroom look. This restorer, by darkening and giving shine to your surfaces, will renew your motorcycle or car. The plastic restorer forms a protective gel coating in order to repel salt, dirt and rain so that your worries of driving in rough terrain or through the rain and losing shine on your car can fly right through the window. This restorative blend can be applied quickly, easily and efficiently when using the included applicator pad to wipe the surface. You can rest assured that Trinova’s Plastic and Trim Restorer is the ideal product to hide the effect of aging on surfaces due to exposure to the elements. The formula used to make this product makes it powerful and effective in keeping your car from cracking and fading. Your car can now look new for a long while to come. One other important feature of this plastic restorer is that instead of using black dye to make this product like other plastic restorers, the manufacturer made it using a formula that ensures your car surfaces are free of streaks after a wash or rain shower. The product is safe to use on rubber, plastic, vinyl and other outer surfaces. 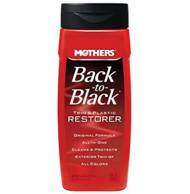 This trusted product comes with greater value and an enhanced look, while maintaining its reputation as the trusted back-to-black formula. With this product, you can easily remove wax residue, light oxidation, surface film and dirt and restore the look of newness on your car’s plastic and trim surfaces, and keep them from being ruined further by airborne contaminants, smog, sun, ozone, water and chemicals. 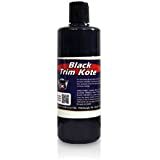 You can use Mothers 06112 Back-to-Black Plastic and Trim Restorer can be used on exterior trim and plastic, seals, bumpers, door handles, vents and moldings. You may need to soak items impregnated with wax residue and neglected black trim thoroughly with this product for better results. 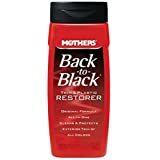 Mothers Back-to-Black Trim & Plastic Restorer is also formulated as a plastic restorative agent that can revitalize opaque plastic and urethane surfaces that are dirty and exposed that are dried out, faded or oxidized. Sunburned and tired molecular bonds can be bridged together on several repeated applications of the restorer. Back-to-Black can restore exterior plastic and trim that are crispy, cracked and faded from black to gray. It would be important to note that Back-to-Black is the only option for extremely deteriorated surfaces. If you a looking for a plastic restorer that will bring to life your car’s vinyl, exterior plastic and rubber trim like housings for your rear view mirror, windshield cowlings, bumpers, door handles and moldings, then look no further than Meguiar’s G15812 Ultimate Black Plastic Restorer. This plastic restorer uses an advanced form of UV clear coat technology which has enabled it to last longer than most trim care products and protectant products. 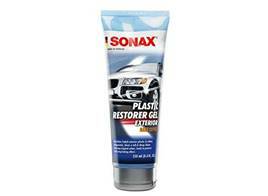 The formula used to make this plastic restorer makes it highly durable, dry instantly and non-greasy. It also will not streak in the event treated surfaces become wet. Plastic and trim treated with this product will have a sparkle and look like new with a shine and long-lasting UV protection. 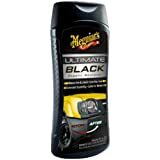 While it is natural for sun exposure to eventually give a car’s exterior trim a dull look, Meguiar’s Ultimate Black Plastic Restorer will bring back the shine to the car’s trim without making the treated surface greasy. The product utilizes high-level hybrid polymer technology to seal surfaces that are not porous with UV protection in order to inhibit more UV damage. The polymers used give the trim back its dark color. The plastic restorer is made such that you will not need to use much of it to achieve the desired results. A foam applicator with a drop the size of a dime will suffice for small sections at one go. When applying Meguiar’s Ultimate Black, ensure that you first clean and dry the surface properly before you apply so that the plastic restorer dries up in between five and ten minutes tops. Ensure the surface is clean, dry and cool before you apply the product. You may need to wash your car and clean the trim using a detailer prior to applying the restorer. Use a foam applicator or a 100% cotton terry cloth towel to apply the plastic restorer. Use a clean cloth to wipe off the excess Ultimate Black plastic restorer from the surface. You can 2-3 times over areas that seem to need more attention. The plastic restorer is not suitable for use on motorcycle or bicycle seats, paint, tire tread, glass, or leather. It should also not be used on clear plastic. You should not apply the product on surfaces that do not have slick or glossy finishes. When choosing the plastic restorer to use on your car, it is always good make sure you first read the manufacturer’s instructions. If you want your car to have that clean, polished look, then it is advisable that you use a specialized plastic restorer. Some plastic restorers have corrosive properties and so you need to ensure you don’t cause further damage to your car. Restorers with black dye are not advisable for application on your car’s opaque headlights.